This past holiday season was a disappointment. I eagerly await Christmas each year but this year, I found myself in tears on my drive back to Minnesota after celebrating with my family in Iowa. Visits to my hometown are always a little difficult as I adjust to a different routine and navigate my relationship with my divorced parents, but this one was particularly trying. In a matter of days just before Christmas, my maternal grandfather passed away and my paternal grandmother was hospitalized after a fall resulting in a broken pelvis. These instances added a level of sobriety and grief to the few days I had at home, making for a rather somber holiday. During my four hour drive home to Minnesota on Christmas Day, the grief that had marked my holiday and the resulting disappointment flooded my mind until tears pooled in my eyes, blurring I-35 into a grey haze. Still processing the loss of a grandparent and the suffering of another, I was also just disappointed that we hadn’t been able to find our stockings to hang on the mantle for Christmas morning. I was disappointed that I hadn’t been able to play cribbage with my dad because he had been so preoccupied with my grandma’s affairs. I was disappointed that the forecasted snow didn’t end up falling. I was disappointed that my mom had been out of town on Christmas Day and I didn’t get to see her before I left to return home. My melancholic heart knows disappointment all too well. Whether it is something small in my day that didn’t stand up to my expectations or an unexpected tragedy, life is riddled with moments that leave me feeling deflated and saddened. These can be as small as spilling red wine on my favorite white shirt or the barista getting my coffee order wrong, to feeling rejected or grieving a death. At all degrees, I’ve experienced that disappointment has the unique ability to initially sting but continue to remain on my heart as it fades into a dull weight. These weights add up over time to create a heaviness that marks every aspect of my person. This heaviness, if I allow it, has the power to smother me. I find myself often fighting against this weight. The weight itself is not necessarily the issue but my reaction to it, it so easily leads me into shame. I recognize that I feel disappointed by something and attempt to rationalize away the emotion. “You two were never even a couple, why are you so upset that he started dating somebody else?” “Your dad had greater things to worry about, how can you be so selfish and upset that he didn’t play a game with you while you were home?” “You knew exactly what you thought, why did you have such a hard time articulating it?” These thoughts plague my disappointed heart and taint any potential healing. I begin to think that I should never have hoped for what is now the source of my disappointment. This is not the voice of our generous and compassionate God. Our Father only speaks words of hope and encouragement into the very real pain that comes from our disappointments. When I dismiss or avoid the disappointment, I also rob myself of a hopeful heart. Where the sting of unrequited love exists is also the hope for a holy and deep love. The pain of a broken family also contains hope for joyful parents and siblings. The embarrassment of an inarticulate conversation holds the hope for finding understanding and making connections with others. 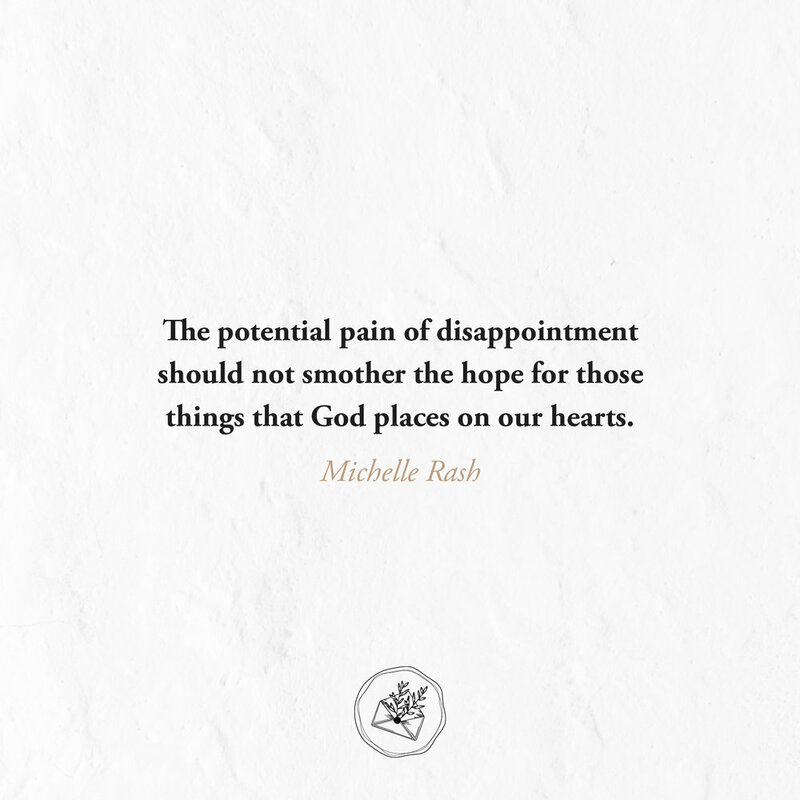 The potential pain of disappointment should not smother the hope for those things that God places on our hearts. It is inevitable that we will experience disappointment. This is not an experience to run away from, it is a part of the fullness of the human experience and a place where we can encounter the true depths of our heart. Saint Paul speaks of this type suffering in his second letter to the Corinthians saying, “We are struck down but not destroyed; always carrying about in the body the dying of Jesus, so that the life of Jesus may also be manifested in our body” (2 Corinthians 4:9-10). The life of Jesus cannot be divorced from suffering. To engage with suffering, including the moments where we are struck down by disappointment, is to allow the life of Jesus to live within us. This keeps us from being destroyed by the tempting voices of shame and hopelessness. Talking myself out of being upset on my Christmas Day drive would not have been a viable option. To cast off the grief and disappointment I had experienced would only be to put up a facade. Rather than fabricating some disingenuous sentiment and deeming my true emotions as trivial, I needed to feel the depth of pain placed on my heart to allow Jesus to meet me there. Jesus wants us, rather he needs us, to be our most authentic selves. Instead of presenting how we think we ought to be, we must simply be. This is the only way he has access to our hearts. It is only when we rid ourselves of the pretenses and pleasantries that our raw and bleeding hearts may be held and cared for by our Lord. I once had an image in prayer of my heart being parched and cracked in my chest. Jesus took my heart in his hands and began to apply a balm that, at first, had a sharp and agonizing sting as it met the surface of my calloused heart. He continued to hold my heart as the pain intensified. After some time though, the sting began to fade and my heart felt soothed. He had taken the reality of my heart and brought peace to the pain. This is only possible when we allow him into the true state of our being. In the midst of this beautiful and oftentimes painful life, this is my prayer for us: that no matter how often we are stuck down, we are not destroyed. I pray that we have the courage to admit to our disappointments, no matter how minuscule they may seem. I pray that we do not shame ourselves because of these disappointments but attribute them to the depth of our emotional experiences. I pray that we do not let disappointment rob ourselves of hope. I pray that these disappointments lead us closer to Jesus as we allow him into our suffering and cling to him for strength. Come Lord Jesus, help us to trust in you as we forge ahead boldly toward the eternal. Want to share the quote below? On your smart phone: press, save and share. Michelle is an Iowa native currently residing in St Paul, Minnesota. In the few years since graduating with a degree in psychology she has served as a college missionary, worked at a bridal store and catering company, ran a marathon, and is now planning events for the Murphy Institute for Catholic Thought, Law, and Public Policy at the University of St Thomas, her alma mater. She especially appreciates the subtleties of her day including Spotify’s “Sad Indie” playlist, reading on the bus, and her nightly cup of chamomile.